A virgin to Roasted Chestnuts, I was hooked after my first bite of this creamy white kernel, encased in a rich hard shell radiating warmth in my hands. The taste it produced was completely novel: a surprisingly soft texture produced a mild nutty yet earthy flavor, but the texture almost reminded me of a baked potato. Nutritionally, I was not far off: chestnuts are actually dietetically similar to starchy foods such as sweet potatoes; but contain protein too. Unlike other nuts, this one is relatively low in fat but rich in minerals, vitamin-C, fiber and phyto-nutrients. It is also gluten-free. 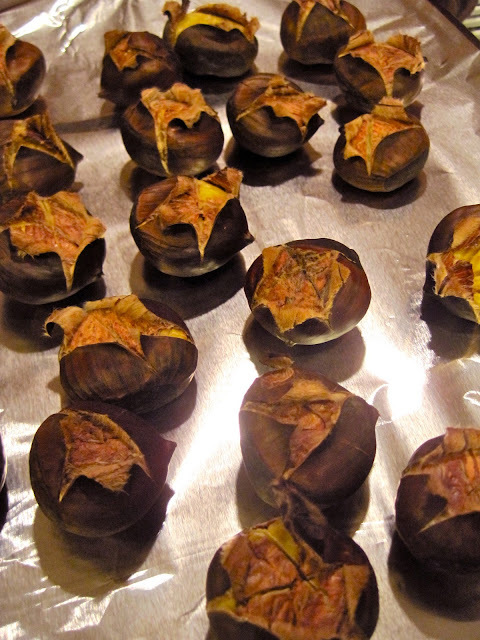 I could've just stopped after roasting the chestnuts: they were such a tasty snack and I enjoyed cracking them out of their shells, like pistachio nuts. However, I loved the idea of using this low cal medium in a chocolate dessert to bring out the unique nutty flavor in a healthy way. 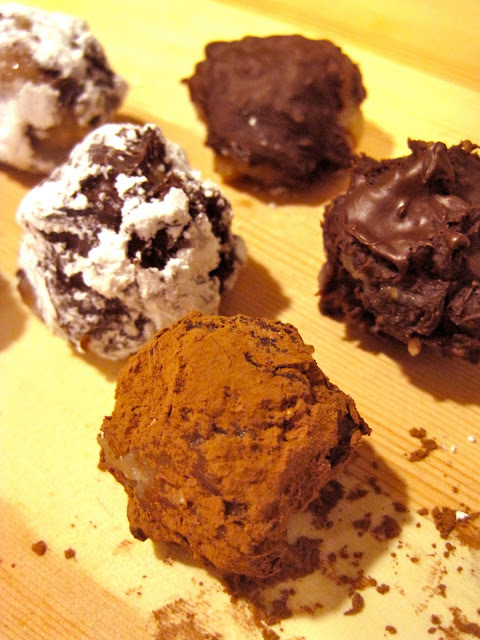 The result was this Chestnut Truffles Recipe. 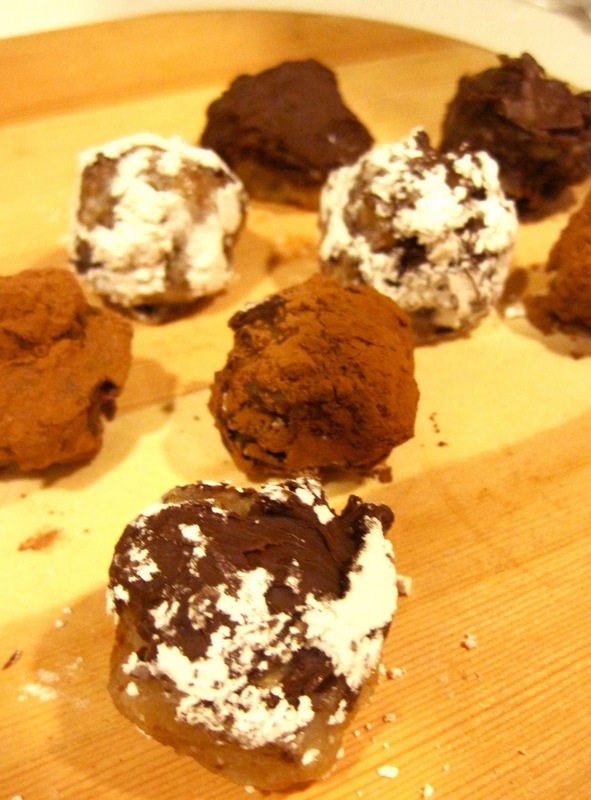 These truffles make a great holiday gift! After you dip them in chocolate, you can roll them in cocoa powder and powdered sugar for some aesthetic variety. I only discovered, this however, after a botched chocolate-dipping experience left my truffles looking spiky and messy. I've changed the directions from the original recipe so you can avoid this and produce a smooth, perfect truffle. My solution: heat more chocolate than you need (you can never have too much chocolate anyway) and dip dip dip! 1. Preheat oven to 425 degrees Fahrenheit. Prepare a baking sheet with foil. 2. 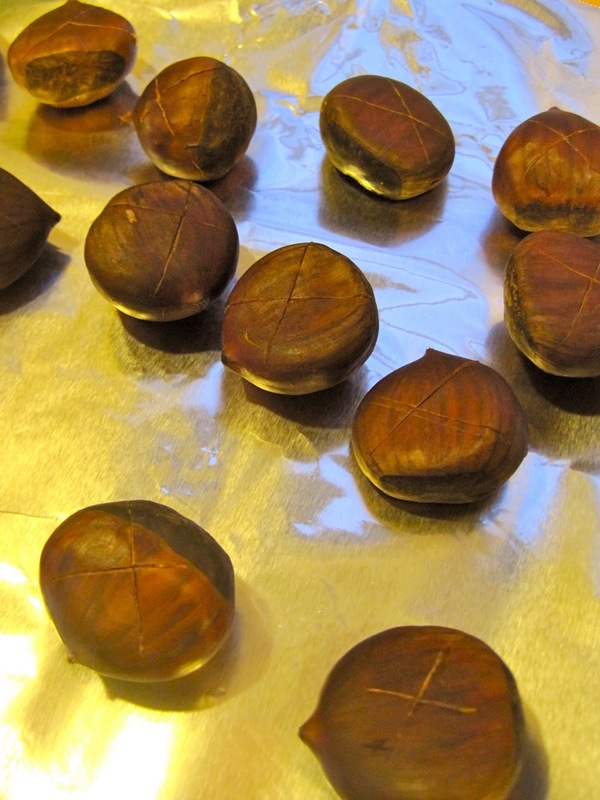 Cut the flat side of each chestnut with a sharp knife. making an X. You MUST do this so they don't explode! 3. Cook for 15-20 minutes. After cooking, remove both the outer shell and inner skin. This will be easiest if peeled when still hot. Like them? Love them? Can't wait to cook with them? See below! *You can buy chestnut puree, but its more fun to make it yourself. After roasting and peeling the chestnuts, puree them in a food processor, adding water until puree reaches desired consistency. 1. Dissolve dry milk in brandy in a small bowl; set aside. Combine chestnut puree, sugar and vanilla in a heavy medium saucepan; heat over medium-high heat, whisking until smooth. Cook the mixture, whisking constantly, until thickened and stiff, 6 to 10 minutes. (Reduce heat if the mixture begins to scorch.) Whisk in the brandy-milk mixture and continue cooking until the mixture is thick enough to stand in peaks, about 5 minutes longer. Transfer to a bowl and let cool to lukewarm, about 20 minutes. 2. Line a baking sheet with parchment or wax paper. 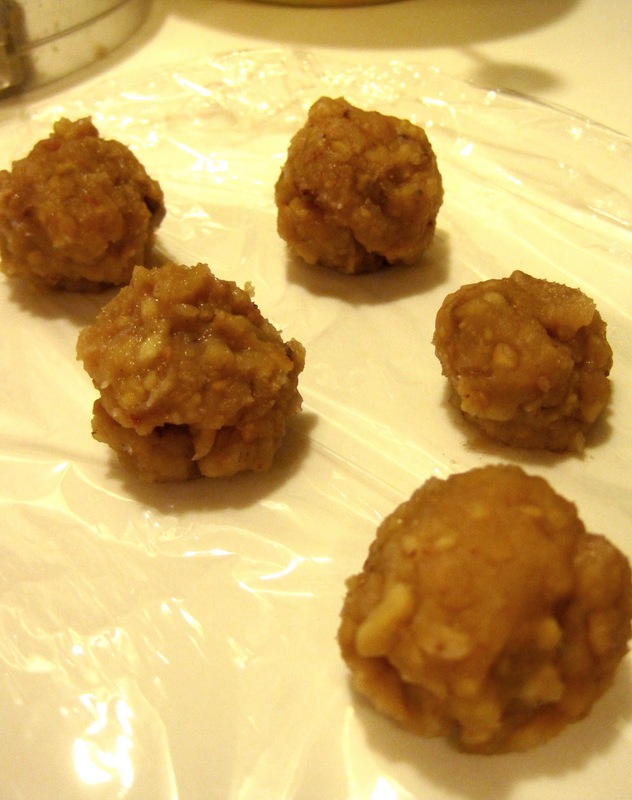 Form the chestnut mixture into 1-inch balls and place on the prepared baking sheet. (Don't worry if the batter is too sticky to form a smooth ball; you'll be able to adjust the shape more easily after they cool.) Cover with plastic wrap and refrigerate until chilled, about 20 minutes. 3. Heat 6 ounces chocolate in the top of a double boiler over hot, not boiling, water. Stir often, until the chocolate melts and reaches a temperature of 120°F. Remove the top of the double boiler from the heat. Add the remaining 2 ounces chocolate and stir until the chocolate is smooth and shiny. Or in a microwave in 30 second spurts, stirring after each session. 4.Dip each chilled ball of chestnut filling into the chocolate mixture. If it is too hot too touch, drop each ball into the chocolate-filled bowl and roll it around with a wooden spoon until fully covered, then scoop out back onto the baking sheet. Transfer the coated truffles back to the baking sheet. * (There will be about 2 ounces of chocolate left over; reserve it for another use.) Let the truffles stand at room temperature until the chocolate has set, about 5 minutes. 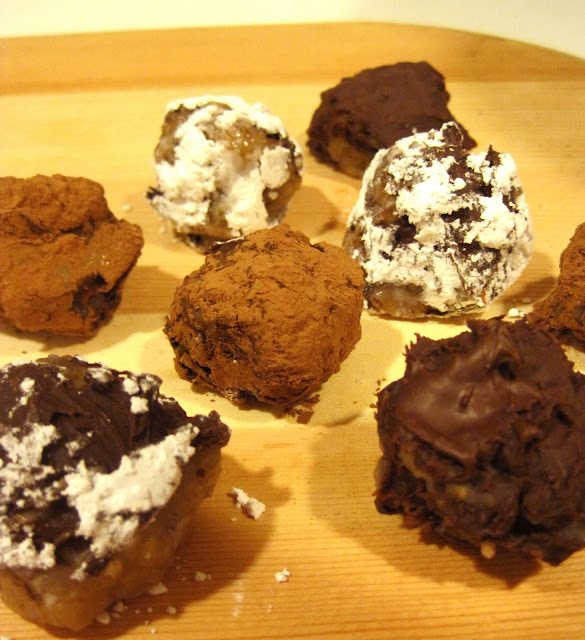 *If adding an extra layer of coating, scatter enough cocoa powder and powdered sugar on the parchment paper to cover the surface, and roll each truffle in the powder until all surfaces are covered. "Chestnut Nutrition Facts." Nutrition-and-You. Web. 13 Nov. 2011. <http://www.nutrition-and-you.com/chestnuts.html>. I have never seen a chestnut before. Now I am intrigued. Must make these this holiday season.